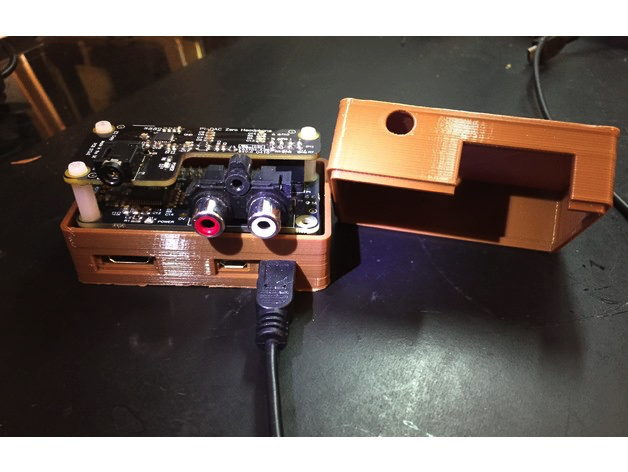 #3DPrinted IQAudio Pi DAC Zero plus Headphone Case #piday #raspberrypi @Raspberry_Pi « Adafruit Industries – Makers, hackers, artists, designers and engineers! This is a snap-together case for a raspberry pi Zero W and attached IQAudio Pi Zero DAC plus Headphone Amp. Top and Bottom each take about 1.5 hours to print. Insert top case mid-way over bottom, slide back and push down starting at RCA Connector (red/white jacks), then make sure all sides are pressed down firmly. This is “kind of” a remix. I followed the tutorial on Layer-by-Layer from Adafruit (https://youtu.be/YxBamwc6s7U), drawing the featured simple raspberry pi zero case from scratch in Fusion 360. Then I added modifications to allow for the Pi DAC.